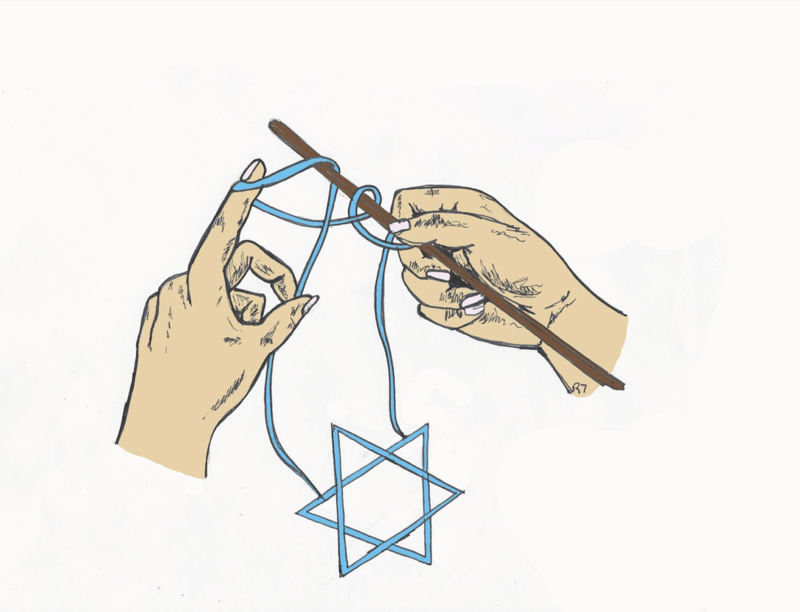 “Knitzvah” is a play on words, combining the Hebrew word mitzvah with knitting, which cleverly describes the focus of the ever-growing Bay Area-based charity knitting group. The organization will be celebrating its 11th birthday this August, and Barbara Berlant, the Knitzvah chair, shares how her passion project quickly turned into a flourishing volunteer organization underneath the umbrella of Jewish Family Services. Barbara organizes meetings and donation distributions. She also maintains a strong relationship with recipient organizations such as schools, shelters, care facilities, and hospitals. My first time walking into the Sunday morning meeting was a little bit daunting. Women pulling yarn from project bags at their feet, each with a pile of finished work and an equally large pile of yarn to take home for the next month’s projects, chatting happily around tables set up in a circle in the room. Totes of yarn lined the front counters: acrylic, wool, worsted, sock yarn, and scraps. After sharing with us the donations that have gone out and the thank you cards from classrooms, parents, and others accepting donations, Barbara invites people to share their finished projects with the group. “Oohs” and “Ahhs” fill the room as each handmade item is held up, and two women sort them by type into large bags on chairs in the back. I quietly sit with my mom. Now, as a semi-regular attendee, I am greeted with hugs and while I still sit with my mom, I have made friends with many different Knitzvah members. I have had the privilege of being part of Knitzvah for approximately two years, and now I have the chance to talk to Barbara about how it all got started. Once Barbara started knitting, she couldn’t stop. She made hats for all of her friends and family, and made baby hats to drop off at shelters. While at a Jewish fundraiser, she had a conversation with Mindy Berkowitz, the Executive Director of Jewish Family Services, in which she shared her interest in a knitting group in the Jewish community. Excited, Mindy told her that JFS would take donations of hats and scarves. Mindy called her back a few days later, and after confirming Barbara was still interested, said, “Well, get your friends together and come knit here!” Both had thought that the other had an already established knitting group. There was no shortage of interest though – knitters came together and began on the first project. Eleven years later, Knitzvah has donated over 20,000 items to over two dozen local charities. Knitzvah’s first project was lap blankets for seniors. They began their first meeting in August. Barbara had never made a blanket before and thought that at her pace, one would take a year. Word spread fast about Knitzvah, and the organization that had started with just one woman’s enthusiasm for knitting soon had 15 members. At their first “wrap up” meeting in December, they gift wrapped 125 blankets for seniors, made in just 4 short months, that were given as Hanukkah gifts. Barbara went on to tell me stories about various introductions to new charities, new donations, and new Knitzvah members. She is amazed by the community response and the donations that pour in. Recipients in need were introduced to Knitzvah the same way that volunteers were, and word spread. A friend of a friend suggested donating to the program Transition Age Youth in Santa Cruz County. When offered hats and scarfs, the organization was grateful, and asked for luggage. Barbara explained, “These kids carry their things around in garbage bags and it makes them feel like garbage.” In the last three years, Knitzvah has given over a thousand pieces of luggage, from duffel bags to backpacks to suitcases.